Yes, but, usually, macaws are not bell ringers, they are more couch potato birds that just like to perch somewhere and chew, walk around following their human or push balls around the floor. Get him a couple of sweetfeet and booda perches, that will give him enough variety so his feet are OK. If you see reddish marks on the soles of his feet, eliminate all hard perches and use only soft cotton ones to allow his skin to heal -and give him lots and lots of food rich in betacarotene. Well, YouTube videos always show the 5 minutes when a bird is doing something cute or been super good but we all know that the other 23 hours and 55 minutes are not like that, don't we? Pajarita wrote: Well, YouTube videos always show the 5 minutes when a bird is doing something cute or been super good but we all know that the other 23 hours and 55 minutes are not like that, don't we? I know Tiko loves to shred wood and she seems to only make noise and swing from bells etc when shes really hyper in the morning or afternoon. Be careful with the pink spots under his feet. They can be the beginning of something called bumble foot (an infection) so they need to be taken care of asap. I suspect that he is has been lacking betacarotene in his diet so get the soft perches for him (to allow the irritated spots to heal) and feed him lots of orange and yellow food: sweet potatoes, carrots, pumpkin or squashes that have yellow or orange 'flesh' like butternut, for example, cantaloupe (my birds love cantaloupe!). If he doesn't eat enough produce on his own, you will have to get it into food that he likes... Try making birdy cookies or birdy bread for him. Birds love cookies, they are real easy to make and you can use canned pumpkin and grated carrots in them: get steel-cut oats (aka Irish Oatmeal in the supermarket) and mix them with the pumpkin and/or grated carrots and some chopped almonds, for example (so he will like them), make a batter that is so thick you can pick it up with a spoon and put little balls of it on a cookie sheet - then bake at 300 degrees until they are dry and firm. I bet he will love them! Pajarita wrote: Be careful with the pink spots under his feet. They can be the beginning of something called bumble foot (an infection) so they need to be taken care of asap. I suspect that he is has been lacking betacarotene in his diet so get the soft perches for him (to allow the irritated spots to heal) and feed him lots of orange and yellow food: sweet potatoes, carrots, pumpkin or squashes that have yellow or orange 'flesh' like butternut, for example, cantaloupe (my birds love cantaloupe!). If he doesn't eat enough produce on his own, you will have to get it into food that he likes... Try making birdy cookies or birdy bread for him. Birds love cookies, they are real easy to make and you can use canned pumpkin and grated carrots in them: get steel-cut oats (aka Irish Oatmeal in the supermarket) and mix them with the pumpkin and/or grated carrots and some chopped almonds, for example (so he will like them), make a batter that is so thick you can pick it up with a spoon and put little balls of it on a cookie sheet - then bake at 300 degrees until they are dry and firm. I bet he will love them! 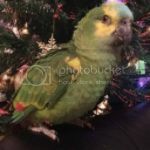 I am really doubtful that you could find a book on how to get your bird to eat a healthier diet, but if you could it would probably be very short unless they filled it up with recipes. The way to get your bird to accept and eat new foods are pretty limited. Basically the ways are to share meals and snacks of bird safe items with them with the best times of the day being first thing in the mornings before the birds has been given any other foods to eat. Another thing that can help is to run the new foods through a blender to begin with and then to mix them in with the foods that the bird does eat and then working with that until you no longer have to hide the healthy foods in other foods. Hiding the good foods in such things as birdie bread or cookies is just a variation on the last. That pretty much covers all of the good ways to teach the bird to eat the variety of foods that it needs to eat. Theres an amazing group on Facebook called FeedingFeathers and theres lots of files.It was a Yahoo group in the 90's before changing to a Facebook group and its all scientific research. Anywhere but china. China will make toys out of zinc a lot, zinc is bad for birds, sometimes deadly!